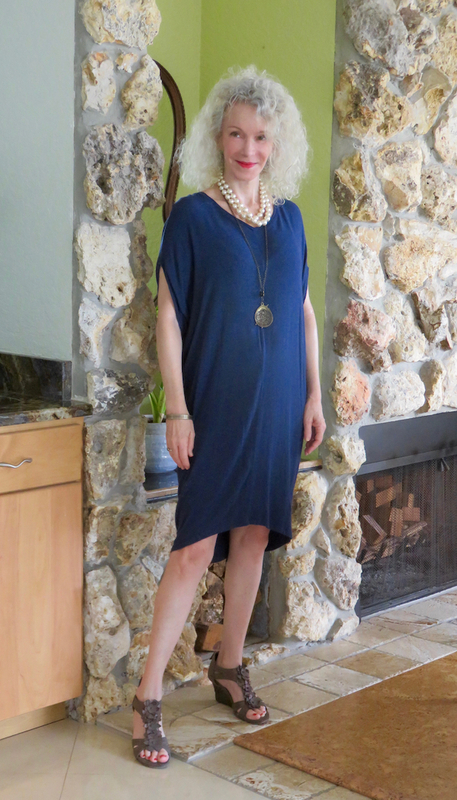 This navy cotton knit dress is soft, easy to wear, and has enough personality to stand on its own, with flat sandals and red lipstick. But today I tried out a few new looks. The bulky faux pearls (similar) plus arty pendant (sim) make the dress ready for dinner out with friends. Strip the jewelry, and add a simple shell-and-fabric belt (sim), and it’s got a go-anywhere, even ride-your-bike vibe. The fun of thrifting – it never gets old. Almost-antique suede sandals (sim) – I just can’t quit you. The belt reverses to a blue-green cotton fabric, also works with this dress. I love the simple Grecian look to this dress, Patti and the colour rocks. ooo Patti, that is a pretty dress. For a moment I thought you were going to keep on stylin’ that beauty one after another ala Mel. I’m sure it has endless possibilities. How nice of this dress to fall right into your lap! I wouldn’t mind at all if some day such a stunning beauty falls into mine. 🙂 Love the way you accessorized with two necklaces! Really pretty. That blue is just so vibrant and although I love the chunky pearls with it and love that belt even more as it’s just so unusual. I agree on Eileen Fisher stuff. Very nice. That dress looks so comfortable and I love the color. I also really like how you added those two different necklaces. An interesting combination that works nicely. I have one Eileen Fisher oversized top from the thrift shop – the fabric is sinfully luxurious. I can see why you love this dress. You show how easy it is to wear many different ways and stay cool. Thanks for the linkup, Patti! This dress makes you gorgeous! I love a dress that you can throw on and get out the door 🙂 Plus, love the royal blue color !! Funny Patti, my mom was just visiting and we were talking about Eileen Fisher as my mom has this amazing coat by her! Love this rich blue on you and I could stare at those sandals for awhile. Love the design! Great addition of color wit the belt! Looking lovely! That dress looks amazing on you. Love your chosen accessories too! This dress was a great pick, it’s adorable and very versatile, plus love the color on you ! Kisses and thanks for hosting the linkup ! Wow this is a huge find – lovely dress! I so fall in love with simple dresses when I see them and totally rock them all year round. But I constantly try to stop myself from adding more than I need. Nice find! Great dress and love bot ways you’ve styled it. Great dress – I love the color on you! How wonderful that it fell into your lap! And it looks great with the necklaces as well as with the belt! Thanks for the linkup & have a wonderful week! Wow, what a find! It’s a perfect color and style on you! Hooray for thrift shop bargains! I’ve never even tried Eileen Fischer’s stuff…but I can see how it’d be so versatile! I think this is a new trend we should start—the LBD (little blue dress)—the color is so great on you! It is a beautiful dress and you look fabulous wearing it. What a lucky find for you. Thanks for hosting and starting out the week with the reminder to be visible. That is such a versatile dress!! It looks great on you! Yes, this color is amazing on you, Patti. A great thrift find! Oooh! What a find! You’re scoring big time lately! I’m not a fan of Eileen Fisher, but this I like. That colour is gorgeous. It brings out the cool tones in your hair. That’s a great find, Patti, and that blue is definitely YOUR color! Dang, I was trying to add another image but it won’t let me use the same URL. Anyways, pfft, the leopard will have to do -I’m sure you don’t need a picture of my tattoo on your blog, Patti! 🙂 Thank you so much for hosting! Looking lovely in this rich blue! Gotta love those comfy dresses! I sell a lot of Eileen Fisher, but have never worn it. I’ll have to keep my next find for myself! I love the dress worn with the double necklace, Patti – that’s a fantastic idea, must remember that!! Thank you for having us each week- it is always soooo fun!! I love this color on you, Patti! And I would love to find some Eileen Fisher in thrift…great find. Thanks for the link up too!